I thought that my family had made it clear, or at least I had, that the Trumps are unwelcome around me, and that my father had been sort of very clear about the line between the McCains and the Trumps,' she told Colbert. 'So I was surprised when they were there. And it made me uncomfortable, and I hope I made them uncomfortable, honestly, with everything,' she continued, referring to her jibes at President Donald Trump while eulogizing her father. 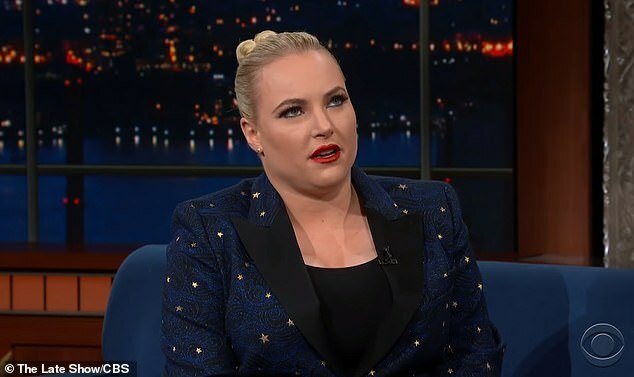 The View co-host Meghan McCain has said that she wishes Jared Kushner and Ivanka Trump had not attended her father's funeral. McCain appeared on the Late Show with Stephen Colbert on Thursday night, describing her shock at seeing the couple at late Senator John McCain's September 1 service at the Washington National Cathedral. 'The Trumps had beef with me then, and in the words of Cardi B, they're gonna have beef with me forever, and I'm not gonna forget,' she said, referring to the rapper's lyrics in the 2016 song Foreva. Well marbled beef, I’d say. Thatll do, pig. Thatll do. That aint beef. Its the other white meat. How about cheap rhetoric from this insipid whale whose only claim to fame is John McVain? Beef with the Trumps? Talking about her dad? ....Its pretty much all she has. What a miserable waste of a life. It’s good that the McCain’s keep reminding us what horrible people they are. She’s just an attention whore and trying to live off the Trump fame. She is such an ugly person. And I don’t mean on the outside. I’m sure that they are scared sh!tless, beefcake. This show is such a flaming dungheap. I have no doubt Colbert only had her to bash Trump, his unfunny late night show is 100% "DRUMPF!" crap all night, every weeknight. she wishes Jared Kushner and Ivanka Trump had not attended her father’s funeral. I can’t say about the beef but there is enough lard there to last forever, in my opinion. Get father was a petty pos hiding behind false decency. What a family of scum. His hatred is destroying her. Or her dads buddies in ISIS. You’re father and his coat tails are gone. Time to stand on your own fat, wobbly feet. That is one big head! And theres one little pea rattling around inside of it.